The Gospel of John teaches us much about St. Andrew who was originally a disciple of St. John the Baptist. When John pointed to Jesus and said, “Behold the Lamb of God!” Andrew understood that Jesus was greater and immediately left John to follow Jesus. He visited in Jesus’ home and later brought his brother Simon Peter, who Jesus also called to be an apostle. It is believed that Saint Andrew and Saint Peter continued their trade as fishermen until Christ called them to a closer relationship, and they left all things to follow Jesus. After Christ’s crucifixion and resurrection, St. Andrew the Apostle preached the gospel in Asia Minor and in Scythia as far as Kiev. Not much is mentioned in the Book of Acts regarding the life of Saint Andrew. 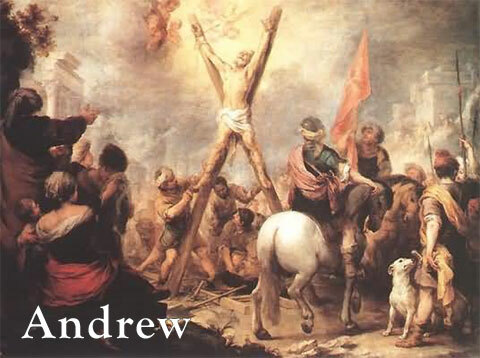 Saint Andrew the Apostle | About St. Andrew life | The life of St. Andrew. 2016. Saint Andrew the Apostle | About St. Andrew life | The life of St. Andrew. [ONLINE] Available at: http://saintandrew.us/. [Accessed 30 November 2016]. Image 1. Posted by CHRIS POBLETE, (2011), The Crucifixion of Saint Andrew the Apostle [ONLINE]. Available at: http://blogs.blueletterbible.org/blb/wp-content/uploads/sites/2/2011/04/andrew.jpg [Accessed 30 November 2016]. Image 2. Miklós Boskovits (1935–2011), “Duccio di Buoninsegna/The Calling of the Apostles Peter and Andrew/1308-1311,” Italian Paintings of the Thirteenth and Fourteenth Centuries, NGA Online Editions, http://purl.org/nga/collection/artobject/282 (accessed November 29, 2016).